I'm a child of the seventies. There, I admitted it. Well, the later seventies anyway. The decade of bell bottoms, disco, Charlie's Angels and soft pop. One of the most recognizable music icons of the early seventies was the late Harry Nilsson. In 1971 he released an album titled Nilsson Schmilsson which was the most commercially successful of his entire career. Who can forget the the haunting notes of The Moonbeam Song or the thumping bass and drum solo on Jump Into The Fire? One of the biggest and longest lasting hits on the album has to unequivocally be Coconut. Huh? You know, “You put the lime in the coconut and drink em both together, put the lime in the coconut and call me in the morning. Wooo wooo!” What a wacky song! My kids both loved it when they were little and we would play the song and sing along doing all of Harry's diverse voices as we went. Fast forward to now. My daughter is singing it to her own baby daughter, crazy voices and all and you know what? My grand daughter loves it! Yesterday I was kind of spacing out at a bowl on my counter holding a few limes that needed using up and Boom! The Coconut song started playing in my head and today's blog post was born! 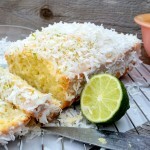 Coconut Lime Quick Bread is adapted from a recipe posted on Portuguese Girl Cooks and features a lightly sweet crumb with a bit of texture from the coconut flakes and lime zest but what makes it truly delectable is the tart lime glaze covering the top and sides. Yum! It tastes so tropical it will transport your imagination to the islands! 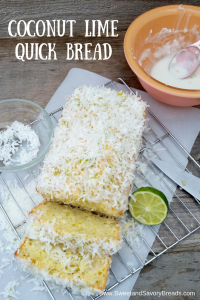 I hope you enjoy this recipe for Coconut Lime Quick Bread and if you manage to consume it without singing the Coconut song, at least in your head, let me know! Do you have a favorite Harry Nilsson song? Please share it in the comments below. We'd love to hear from you! 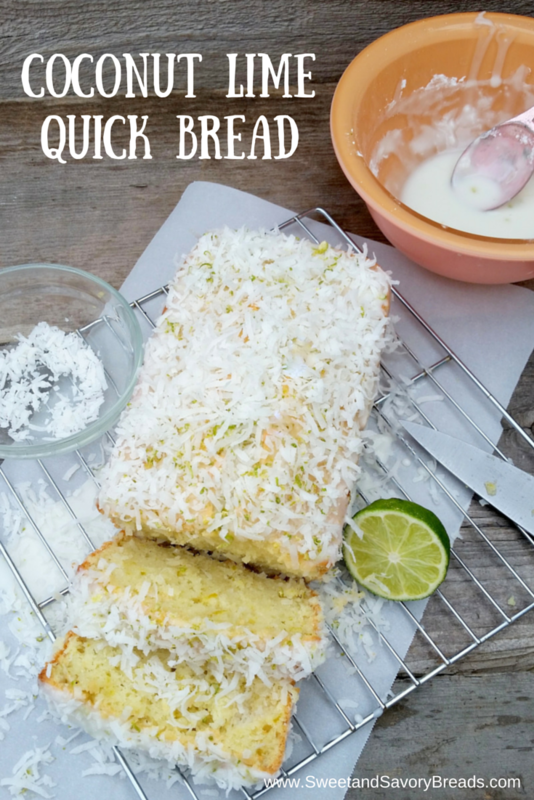 Coconut Lime Quick Bread stirs together in minutes and has a lightly sweet crumb and a tart/sweet lime glaze. A tropical taste that will transport you straight to the islands! Preheat oven to 350 degrees F. Lightly grease and flour an 8x4 inch loaf pan. Set aside. In a medium mixing bowl place sugar, melted coconut oil and eggs. Whisk together until well combined. Add the coconut cream and the lime zest and continue whisking until blended. In a large mixing bowl place flour, baking powder, salt and coconut and stir together until well mixed. Pour the wet mixture into the dry and stir until just combined. Do not overmix. Pour the batter into the prepared loaf pan and bake approximately 50-60 minutes until a toothpick inserted in the middle comes out clean. Cool for ten minutes before removing to a wire rack to finish cooling completely. Whisk lime juice and powdered sugar together in a small bowl until completely smooth. 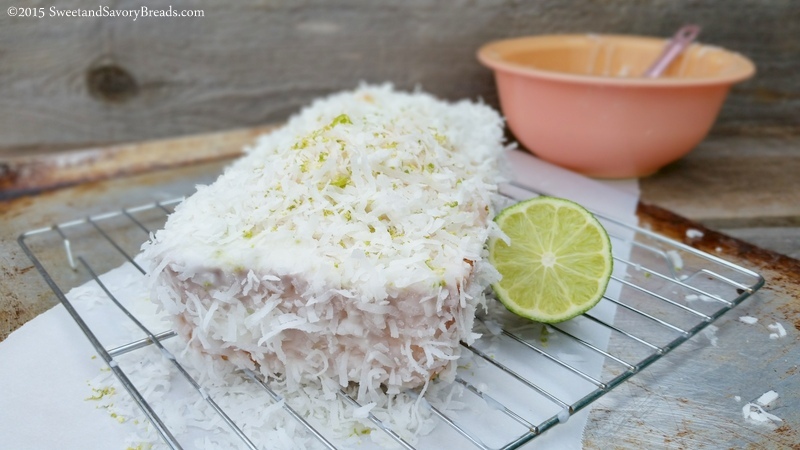 When bread is completely cooled down, cover with glaze and top with additional coconut and bits of lime zest. This bread is excellent the next day after all the flavors have melded. Wrap tightly and eat or freeze within three days. Posted in Breakfast Breads, Quickbreads, Sweet Loaves for GiftingTagged bread, breakfast, coconut, glaze, lime, loaf pan, snack, sweetBookmark the permalink. Thank you Katie, it definitely was yummy! As for the songs I guess that shows my age (or hubby’s). I was actually only an elementary student when that album debuted. Thanks for stopping by!